With a remarkable executive career and three adorable children among her many achievements, Natalie Feehan knows a thing or two about smashing the juggle struggle. Natalie draws on her incredible experience and senior leadership role at MYOB to actively support working parents and help overcome the barriers preventing women moving into senior leadership roles. As she returns to work from maternity leave, we are inspired by her passion to make changes that will help those who follow behind her. We love Natalie’s tips for mothers working toward a career in senior management, why it’s important to stop being a martyr, and her wise words on being present in the moment. I worked in event and then marketing roles across a number of large companies (HSBC BMW, MINI, GE, Mercedes, Coles), before landing a role at REA Group (realestate.com.au). 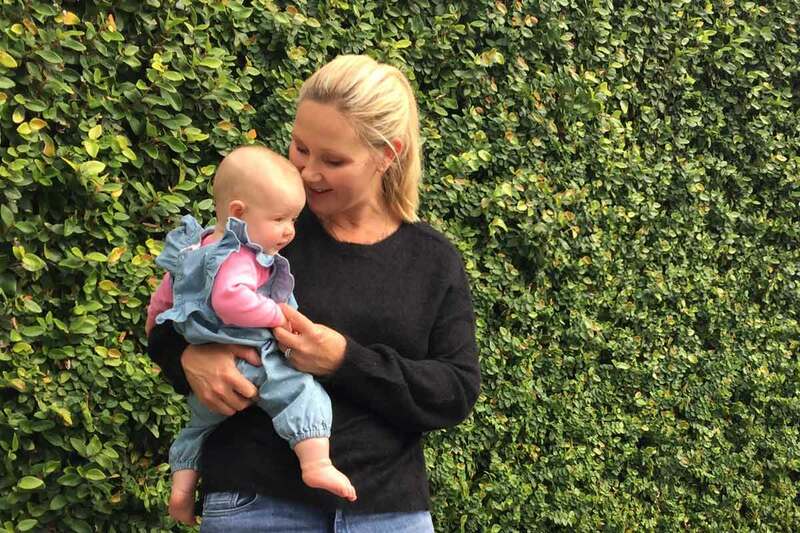 It was at REA where I was able to work in a high growth company and, at the same time, really grow my career by moving into a number of different roles, whilst also having two kids. I developed a passion for working in technology companies that saw me move into a group executive role at MYOB as EGM of Marketing. Has going on parental leave helped or hindered your career journey? Going on parental leave has provided me with great opportunities to return to work and try something new. You don’t always have the chance to go back into the same role you were in prior to your leave period, and this can be a huge career benefit (even if it doesn’t feel like it at the time). You have two gorgeous children who are at primary school, and you’ve recently had a beautiful baby girl. How has your experience been this time? It has been so different third time round. Having a bit of a gap between my first two kids and my third gave me time to reflect on the things I wanted to consciously do differently. I went on this latest maternity leave wanting it to feel purposeful. In times gone by I almost wished away some of the time; or found myself thinking things like ‘I’m sure it will get better when… they sleep for more than 45 minutes, start crawling, can feed themselves, etc.’ Now I know how quickly the time goes, how fleeting every phase is, so this time round I wanted to be in the moment and not wish for anything other than what was presented. I have also treasured the opportunity to spend more time with my oldest two kids, Ellie and Emmett, during my maternity leave. I was lucky and grateful to spend the summer holidays with them at home. I was also able to settle my son into prep and do school pick-ups. How has having children changed you? Are you more or less ambitious career-wise? I love my children to bits, but I think I’m more driven career-wise than I was before having kids. Firstly, if I’m going to work and going to be away from my kids, I want it to be purposeful and meaningful. Secondly, I’m just determined to prove I can do it. I believe you can have a great career and be a great mum – you need a lot of help and support, but it can be done. You’re a group executive at MYOB. How has going on maternity leave this time made you look at things differently? Well, it is terrible to admit, but prior to being pregnant I hadn’t spent a lot of time looking at or thinking about the MYOB parental leave policy. We have so many mums leave and return on parental leave that, whilst I knew the processes, I was surprised how little I had thought through the implications of specific programs. I worked with the executive team to do some small things like alter our paid parental leave policy payment terms to make the payments and timing more flexible. I am very keen, on my return, to keep working on building and developing our parental leave processes. You are getting ready to return to work. What are you most looking forward to? And what are you most worried about? I am most looking forward to the daily interactions, conversations, thinking and learning that happens at work with my amazing colleagues and team. I am most worried about the fact that whilst on leave, I’ve noticed how much more present I’ve been able to be with my kids, family and friends. I feel like the mental load for working mums is so big that it’s hard to always be present in the moment without your mind wandering. My personal goal will be to work on this. What do you think are the biggest barriers for women to move into senior leadership roles? What needs to change? What can companies do in a practical sense to better support women? Well, I’m currently very frustrated with the government changes to child care support and funding. Women in senior leadership roles often require a high level of support provided by child care/school/nannies, etc, at a huge cost, to enable them to meet the demands of the job. Removing child care funding support for women with high income senior roles in the workforce is not helping to create and motivate more women into senior positions. I have thought about what companies can do and I think there is a huge need to support women earlier in their careers (before they go on parental leave). Mothers typically take two to three years out of their career having kids and returning to work, often at a time when they are just gaining momentum in middle management. By identifying high potential women earlier on, we can help them navigate career growth during this time, rather than allowing their careers to plateau or go backwards as a result of being out of the business. It shouldn’t be acceptable that women do not talk about their desire to have children at work or as part of their development discussions at work, in fear that they will somehow be penalised. We should be actively factoring this into women’s career paths. What is your advice for other women who have ambitions of becoming senior leaders while having a family? Find an employer who actively supports working parents. Your success and development will be limited (and very emotionally difficult) if the system is working against you. You can only be your best in an environment that enables you to be your best. Work for great women. I have had the opportunity to work for amazing women who were able to teach me so much. I think, working for women early in my career was a great way to build my confidence. Something always has to give, so be clear about your priorities, decide what is most important and separate the non-negotiables from the negotiables. Forget mother’s guilt. So many mums spend their lives feeling guilty. If you love your kids and are doing the best you can, there is nothing to feel guilty about. Let. It. Go. Don’t be a martyr. This can so easily apply to us working mums – putting our families, our work and our friends’ needs ahead of our own. Do what you need to do to be happy, because no one else is going to do that for you. Your personal and work life cannot be separated – we live one life, so don’t try to manage a personal diary separately to a work diary. Life is a set of scales whereby sometimes work, and at other times personal life, needs more attention. But you need to manage them as one to be successful at both. I highly recommend reading The Balance Myth by Teresa Taylor – it’s a great book! Instagram sites that inspire you… @everytown @witness_change @ted (TED Talks) @natgeo (National Geographic) and a hilarious group on Facebook called Mums Who Organise. I’m happiest when… I’m swimming in the sea (with my family close by). I’m addicted to… shhh, Candy Crush! Favourite wardrobe staple for work… silk shirts. Favourite wardrobe staple for weekends… jeans. My role model is… my daughter (confidence) and my mum (love and patience).